Anyone that has studied economics at any level will have heard about Price Discrimination. I first learnt about Price Discrimination when I was just 17 years old as part of my A-level economics course. It is an essential part of any basic microeconomics course. It is also the key to understanding how media owners can maximise ad revenue. For this blog post, I will first describe what Price Discrimination is and secondly describe how to use it as a real-world programmatic media pricing strategy. It’s been a while since I studied Economics, what is Price Discrimination? Price discrimination is simply a pricing strategy where a seller sells similar goods or services at different prices to different buyers. The price charged to each buyer depends on their willingness to pay. Sometimes people use the term differential pricing for the same thing. See here for Wikipedia definition. See below demand curves (remember those?) for ad inventory. The first chart shows the typical situation, i.e. a technology-led solution with no coherent sales strategy and a single exchange price (bid floor) and multiple exchanges. 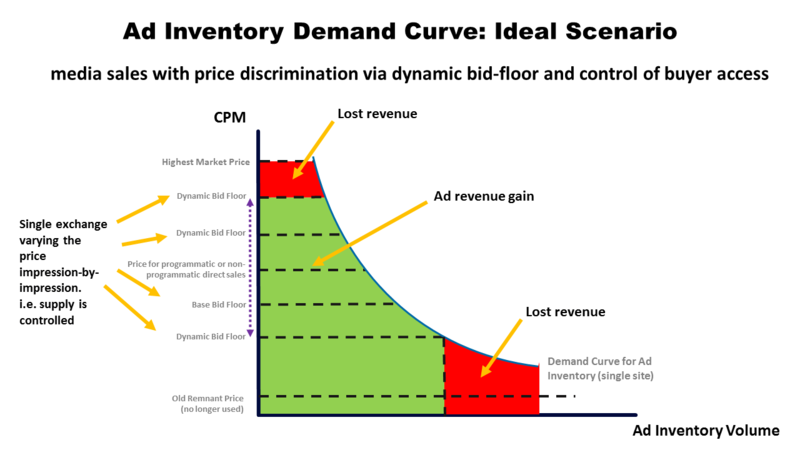 This is contrasted with the ideal scenario, where a price discrimination sales strategy enabled by a single exchange set-up with dynamic bid-floors. It can clearly be seen that the firm earns more money where it can set a price for each buyer. Two things need to happen if a price discrimination strategy is to work. Firstly, the Publisher must be able to find out the maximum each buyer is willing to pay. Secondly, the Publisher must prevent reselling and arbitrage, i.e. allowing buyers from selling to each other. The first condition sounds really difficult to achieve in any practical way… at first. Even looking beyond digital media, how can any firm simply ask customers how much they are willing to pay then charge them that amount? The answer to that depends on the nature of what is being sold and the market structure. There is always a way of finding a mechanism or proxy to calculate willingness to pay. Probably, the easiest type of market to operate a price discrimination strategy is in a market for perishable goods. The reason is that the product being sold is restricted by time and time is used as a mechanism to tease out willingness to buy. The best example is the travel industry. All travel tickets have a fixed expiry time, a flight ticket has a zero value one second after the gates close. The value of a plane ticket depends on three main variables: type of seat, day/time of flight, days/time from departure. Most of us have compared these three variables when booking a flight and when this happens we are working out our willingness to pay! The second condition sounds difficult too. How does a firm stop an intermediary from buying at a low price and selling at a higher price (i.e. arbitrage)? This is achieved by strictly allocating the product to the buyer. Again, the easiest way to do this is with perishable products. For example, most tickets for most events or travel are restricted to the buyer. In many cases, the firms selling these tickets have lobbied lawmakers to make it illegal (or at least very difficult) to resell tickets. This is the case for everything from festival tickets to airline tickets. It should be no surprise that changing a name on a flight ticket (even when it is to correct a misspelling) is so difficult and costly. Does price discrimination really work? Price discrimination has been around a very, very long time. That should give some indication of how useful a strategy it is. The first serious academic work on it was done by the French civil engineer and self-taught economist Jules Dupuit in the 1840s. However, Dupuit only provided the first rigorous academic analysis to what was already common practice. There are many examples of price discrimination strategies in practice, for examples the use of coupons, premium pricing (i.e. economy, regular and premium prices), student discounts, pensioner discounts and volume discounts, etc. However, the best single (and most advanced) use of price discrimination has got to be in transport market, particularly the market for plane tickets. This has become so sophisticated there is now the concept of Dynamic Pricing, where pricing automatically changes according to complex business rules and real-time market demand. 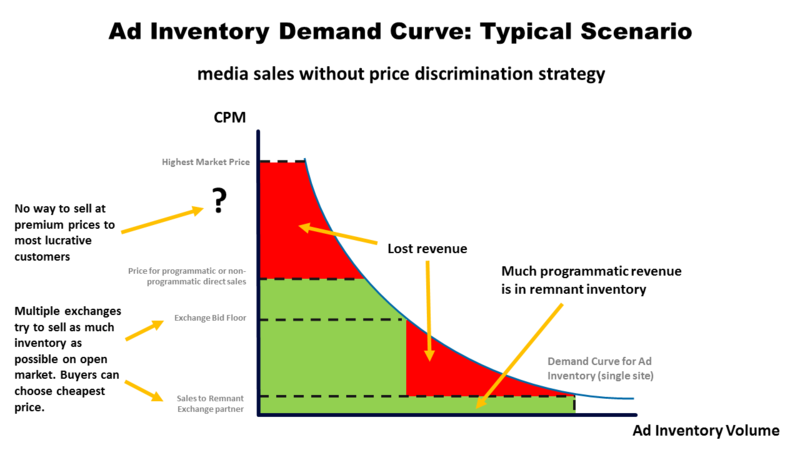 What about implementing price discrimination in the programmatic digital display market? Prior to the current programmatic ecosystem, a salesman could negotiate in person or over the telephone to extract the highest price they could for whatever media they were selling. In this, albeit it unscientific way willingness to pay could be understood and exploited by the media owner. In the programmatic ecosystem, there are literally thousands of media buyers. Since your audience is made up of individuals, not all of your site’s audience are equally valuable to these thousands of advertisers. Therefore, it makes sense to charge differently to different advertisers. The huge problem (for Publishers) in today’s’ programmatic market is that it the market is dominated by large ad tech players that operate on an arbitrage basis. I call them “End-to-End Ad Platforms” (see more here). These are ad platforms that both buy ad media from Publishers and sell ad media to Agencies or Advertisers. The business model of an End-to-End Platform is to arbitrage between the lower sale price of the Publisher and the higher buying price of an Agency. They don’t want Publishers to know how much agencies/advertisers are willing to pay because if this market information is known to Publishers it will destroy the ad platforms business model. This is one of the main reasons why there is so little transparency in programmatic markets. The result is a digital media market that is inefficient and ineffective. It is hardly surprising digital publishers are struggling while digital marketing spend increases year-on-year. Publishers using an End-to-End platform (e.g. DFP with AdSense or AdX) will not be able to operate price discrimination sales strategy effectively. This may sound a little vague, so see below seven practical recommendations of how this can be achieved. Use a publisher-focused ad platform that only works sell-side. If you use an End-to-End ad platform you will NEVER be able to price discriminate effectively. There are not many Publisher focused platforms, but the company I work for (AdUnity) provides one of them. Be Open to Opportunity and Gather Market Intelligence. One of the main benefits of the programmatic ecosystem is that it opens a Publishers inventory to many thousands of potential buyers. Many advertisers spend their budgets retargeting their customers in open-market auctions. When the target audience is small, the winning bid CPM can be in very high (hundreds of dollars). So carefully probe open-auction markets via the ad exchange of publisher-focused ad platform to increase high-value sales opportunities. Approach New Advertisers that appear via Open Auction markets. A few of the new advertisers found on the exchanges may be appropriate for direct sales. Larger new buyers can be approached directly for programmatic Automated Guaranteed deals, or traditional IOs. It may be more lucrative to approach them directly. Block Buyers on the Exchange (where necessary). In some cases, if direct advertisers can buy your site’s inventory on the open market it will significantly weaken your negotiation position.Therefore, you may wish to block your most important direct advertisers from buying on the open market. Therefore you need to be using an exchange with advanced Brand Protection features (AdUnity’s AUX has these). Price discriminate using Dynamic Bid Floor Technology. Dynamic bid floor technology automatically varies the bid floor depending on market demand. This is the key way to implement a price discrimination strategy in a programmatic environment. At AdUnity our bid floor technology is called Dynamic Lift (see more here). When enabled by the Publisher the Dynamic Lift technology takes into account bid quality and bid density for specific users/devices as well as a comprehensive view of the bid landscape. Every impression has a new bid floor set in real-time depending on current market conditions and historic demand for any given audience/inventory. The automatic bid floor adjustment is in response to both the price level and intensity of current and historic demand as well as other factors. Optimise Ad Formats. Buyers can only buy media for the ad formats in their campaign. Therefore, demand can be format specific due to differences in campaigns, audiences and devices. Publishers should make as many formats available per page. This does not mean the page should be full of ads. Only the most lucrative 2-3 ads should be shown per page. In addition media, buyers often look for packages of inventory. This means some formats often sell in a package, if available. Hence there is an opportunity to sell more than one placement to the same advertiser. Therefore, it is best to offer multiple options of placement packages, to widen selling opportunities and maximise yield. AdUnity is one of the few companies that can optimise yield so only the most lucrative ads will run and do this without increasing overall number of sold impressions. Implement Yield Optimisation Technology. Maximising revenue means comparing all the different sales channels (direct sales, premium, open-market, mobile, video, etc) and selecting the best option in real-time. Only through the real-time combination of all sales channels and real-time analysis can yield be maximised. Therefore, use yield optimisation technology (there is no other way to do it). At AdUnity we have a Yield Engine as part of our enterprise ad server/mediation platform. It compares different sales channels in real-time on an impression-by-impression basis while also considering delivery goals for direct orders and current market conditions. ADUNITY is a publisher focused ad technology company based in the UK with offices in both London and Bucharest. We deliver trust, transparency and advanced technology in the programmatic ecosystem. AdUnity provides transparent trading platforms for publishers (no black boxes) and does not operate an arbitrage model; just a flat revenue share. We comply with the latest programmatic standards (OpenRTB 2.4) and format standards (HTML5, VAST 2.0, VPAID 2.0, MRAID 1.0, Native Ads API 1.0). AdUnity works with the largest media and agency groups in Central and Eastern Europe and Turkey. 20 years commercial and product experience in digital media, mobile and advertising, with deep domain experience in programmatic advertising and media trading. Sector Experience in: Advertising, Digital Media, Mobile/Fixed Line Telecoms, Broadcast TV, Consumer Electronics, SaaS. This includes B2C and B2B marketing and product development. Why are European B2B publishers obliged to gain consent for someone else’s business model? GDPR: the opportunity is in the detail for media owners. Part One. Este publicitatea nativă potrivită pentru promovarea business-ul tău? GDPR 2018 în online – Consimţământ liber ales?